From the Best-selling author of The Reader. Note how mentioning Bernhard Schlink's direct participation in The Reader's birth made the title Homecoming more interesting if not increasingly credible and intriguing? It is a painful truth about life. We are defined by our pasts, as we carve our presents... as we gaze to our futures. But what is it really like to come home? Obsessives would also dare ask, what does it take for one to come home: a map, a compass, a strong navigator's impulse? Similar to the heavily alluded Odyssey, Homecoming is a story of self-discovery as defined by a series of connection, re-connection with life, with people and hard to describe, with stories. Homecoming is a redefinition of Summer. It is a noticeable warmth; both delicious and risky to bask in. If I were to describe Homecoming in but a few words, I'd compare it with balance. It is a contradiction: both silence and noise, forgetting and recall, trust and betrayal, natural and enforced. 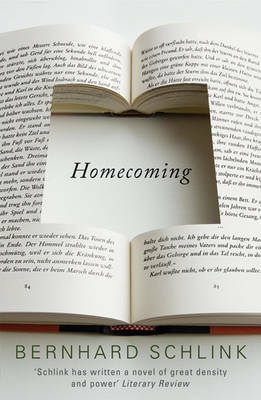 I don't know how young one should be to appreciate the keenness of the book; but I do recognize the maturity Homecoming also demands from its reader. How else do you explain it's recasting of "the golden rule" as a behemoth of love, peace and justice. Ah, let's not stray from justice itself. The way Homecoming re-conceptualized "justice" is surely solely for the open mature mind. It teaches about the values of history (and the importance of learning the lessons history teaches). It highlights the valiance that can only be the reason behind a persistence both foolish and passionate. Because this summer is all about finding inspiration, I'd like to share 9 interesting points mentioned at the latter part of Homecoming... I hope these notes bid you well. "The idea of a confidence man in spite of himself is a contradiction in terms. Because a confidence man wants to be more than he is, and if he wills it, it cannot at the same time be in spite of himself..."
1. Make the most of what you have. 2. Make the most of what you know. 3. Do not hide your weak points: turn them to your advantage. 4. Play your part in such a way that you can pursue your interests instead of hiding them. 5. Do not make unnecessary use of your false identity. 6. Do not introduce yourself under your false identity, let other people invent it for you. 7. The secret of success is secrets. 8. Gain the symphathy of those who mistrust you. 9. Do not try to hush up your defeats. Don't forget to join my BOOK GIVEAWAY, click this link.